…the deceased came out of his workplace Benghazi Medical Center to check on his family and as soon as he entered the area which is witnessing violent clashes was shot in the head, killing him instantly. The first time I met Dr. Al-Sweii, in March 2012, he was waiting for us at a beachside cafe in Tripoli’s fashionable Gargaresh district. He received us with a dazzling grin, in big fashionable traffic cop glasses and an immaculate suit. I can’t recall exactly what I made of him at the time but I probably assumed at first he was just another one of the good-time boys cruising around liberated Tripoli in shiny cars and tight Italian t-shirts. My notes from early in the meeting are not without a dose of humanitarian snark in the margins (“not clear if has heard of the Guiding Principles on Internal Displacement”). Whatever my first impressions, though, the rest of my notes spoke volumes. As the sun sank red to the Mediterranean, Mohamed walked me through a comprehensive aid delivery program built on the same goodwill and amateur enthusiasm that was powering every other government function and public service in Libya at the time. The difference being that his efforts targeted the virtual untouchables of the revolution, the communities driven out from their homes, persecuted and made to bear collective guilt for four decades of humiliation under the ousted dictator Muammar Gaddafi. The next time I met Mohamed, it was in the cavernous bullet-riddled former Mercedes dealership in the center of town where he spent his days coordinating aid delivery, escaping to unwind in the cool breezes of Gargaresh only late in the afternoon. 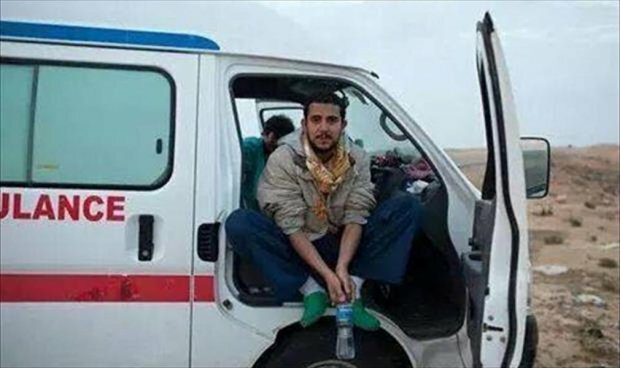 It was perhaps at this time I heard the whole story of how he had been a medical student in Benghazi when the revolution broke out and volunteered to fly back and forth to the front lines at Ajdabiya, rescuing battle-wounded overnight revolutionaries in a jerry-rigged ambulance. Dr. Mohamed put a face on those turbulent times for me. It was him, young and idealistic, suppressing his fear by the things he could do with his own mind and his hands, who would build up a new and better country. Now, three years after the revolution, Mohamed found himself back in Benghazi, once again risking his own life to save those injured in a far murkier and more ambiguous conflict. People like Mohamed, or the human rights lawyer Salwa Al-Bugaighis murdered last June in Benghazi are the most important resource Libya has. A country denied institutions cannot afford to lose the individuals who give of themselves most freely. Rest in peace Doctor Mohamed. Libya, heal thyself. The immediate inspiration for this post was the fact that the International Committee for the Red Cross (ICRC) recently put online its vast and expanding database on which norms of International Humanitarian Law (IHL) are now deemed to have attained the status of customary international law (CIL), binding on all parties to armed conflicts whether or not they have ratified (or otherwise assented to be bound by) the treaties that give rise to these rules. The database consists of both a comprehensive listing of the rules now deemed applicable and a compendium of practice, both that which supports the emerging rules and objections against its validity (anyone want to take some wild guesses on what states frequently feature in the latter category?) In the new online version, the practice of some seven further states and a number of international tribunals have been added. The new database constitutes a highly accessible and useful tool alongside ICRC’s additional databases on treaty ratification and application by States Parties. The good news is that there has been considerable progress in this area. I have written on this blog and elsewhere about the role of soft-law documents like the 1998 UN Guiding Principles on Internal Displacement in consolidating a human rights based approach that has transformed humanitarian action in the post-Cold War period. This transformation has brought new possibilities for advocacy by pairing the cautiously phrased and state-centric provisions of IHL with the less ambiguous and more individual-oriented rules of international human rights law (IHRL). Moreover, because advocacy for the Guiding Principles has focused on engaging willing states (at the risk of to some extent being co-opted by them), they have been far more successful than most soft-law standards, to the extent of having been incorporated in numerous national laws and policies (compiled by the Brookings Institution here) as well as a groundbreaking regional convention adopted by the African Union. This, in turn, has provided support for customary IHL to more vigorously address areas such as the prohibition against arbitrary displacement (including in internal conflicts), the right of voluntary return for internally displaced persons (IDPs) as well as the state obligation to respect their property rights. However the new force and reach that a rights-based approach has given to IHL has brought new risks as well. Most obviously, by encouraging humanitarian actors to condemn violations of human rights (such as forced displacement) and demand accountability and remedies (such as restitution), the rights-based approach may create dangerously high expectations on the part of beneficiaries of aid while simultaneously undermining the perceived impartiality of humanitarian actors. In the worst cases – and we do not have to look far to find them – this limits the access of humanitarian actors to vulnerable populations and puts their own security at risk. As a result, this ongoing retrenchment of the rules of conflict has opened up new policy debates, most recently in the extremely difficult humanitarian arena of the Syrian conflict. The latest iteration came with the 28 April 2014 publication of an open letter signed by 35 eminent legal scholars. The letter noted that 3.5 million civilians – over a third of those in urgent humanitarian need in Syria – are living in areas accessible only from neighbouring countries. However, because Syria has denied consent to humanitarian actors operating in Syria to send cross-border aid, these civilians face a catastrophe. The substantive resolution is, for the first time, independent from the mandate of the Special Rapporteur on IDPs, representing a strengthened commitment from UN Member States to recognise their own role in promoting and protecting the human rights of IDPs. A few things went through my mind at this point. One (facetiously) was that it was a bit cheeky of the Council to celebrate the mandate’s twentieth birthday by beginning to make it redundant. But the other was genuine disbelief that we have already been witness to two decades of IDP advocacy. Having started law school in 1996, the height of the post-Cold War, pre-9/11 human rights window, I was hardly present at the creation but had at least heard about it in real time. UPDATE – Pursuant to Chris Huggins’ eminently sensible suggestion that my proposal to start an HLP WG should actually be visible somewhere on the Aid Source site, I have now contrived to initiate a discussion on the topic. Feel free to wade in. FURTHER UPDATE – After one week, my discussion topic has garnered a grand total of six views and no responses. As a result, I have decided to go with the flow and join the foodies group! The last decade or so has seen growing recognition of the major role played by competition for land in generating conflict. However, the often extremely complex and embedded nature of such conflicts—and associated political sensitivities—is such that both international and national actors have in many cases shied away from fully engaging with them. In other cases, forms of intervention have not always sufficiently taken into consideration their major—and potentially recurring—causes. The challenge is to better understand the role played by land, combined with related factors, in the generation of conflict—both in terms of the conditions that create a vulnerability to conflicts and events that tend to trigger violent conflict—as a basis for preventing or de-escalating violence. I had worked on land issues from a development standpoint in Mozambique, Sudan and Cambodia, but a 2009 study in Rwanda for the Overseas Development Institute and follow-up work with UN-Habitat made me aware that the humanitarian community working in peacebuilding contexts had developed new ways of looking at land conflict and useful short-term approaches for addressing it. The land tenure in development community had little knowledge of these and often saw land policy and administration exclusively through an economic development lens. At the same time, those in the humanitarian community working with post-conflict land issues lacked familiarity with the role of land tenure in development processes and sometimes did not appreciate what was needed to lay the basis for sustainable, sound land governance. These bodies of understanding and differing perspectives about land issues had not been integrated-an integration that is essential to the development of effective strategies for prevention and mitigation of land-related conflict. With these challenges in mind I agreed to work with the Initiative on Quiet Diplomacy (IQd) to develop a handbook on Land and Conflict Prevention The handbook is one of a series providing third party actors with practical guidance in addressing issues that are frequently the sources of tension before violent conflict (re)erupts. IQd’s approach to me coincided with a train of thought that began when I worked with UN-Habitat on post-conflict land issues. I was struck by the fact that the valuable thinking that had been going on in the post-conflict context needed to be walked back through time, as it were, into the pre-conflict period, asking “What do we know about land and conflict that can be mobilized for prevention?” The result is a blend of ideas and practical guidance for preventing land-based conflict drawn from both the post-conflict and developmental contexts. I’m happy to announce the release of a report I wrote (available for download here) for the Norwegian Refugee Council (NRC) Liberia Office based on recent fieldwork. The report focuses on the plight of the hundreds of thousands of people displaced to Liberia’s capital, Monrovia, during the 1989-2003 conflict who chose unassisted integration into local informal settlements over assisted return to their homes of origin elsewhere in the country. In resisting the expectation that they would return by becoming urban squatters, these internally displaced persons (IDPs) dropped off the radar of many humanitarian actors. However, their continued presence – which may have effectively doubled the population of Monrovia – has become a development question as infrastructure projects, investors and returning landowners begin to place pressure on the Capital’s many slums. The significance and potential volatility of the issue is reflected in the Liberian Land Commission’s decision to prioritize urban land issues in 2011. Recently the Geneva Centre for International Humanitarian Demining (GICHD) explored new ground in linking land rights to ‘mine action’. Mine action is essentially all the activities related to demining efforts–certainly taking mines out of the ground but also the related activities of survey, record keeping, education, advocacy, turning cleared land over to government, dealing with local communities, etc. The Centre commissioned seven studies on the relationship between landmines and land rights (Afghanistan, Yemen, Angola, Sri Lanka, Cambodia, South Sudan, and Bosnia) and then held a workshop in Cambodia on the topic designed to chart a way forward for policymakers. Coming at the topic from a land tenure perspective I found it all quite intriguing. The studies revealed a lot more connections than I had realized. The spatial aspect of both land tenure and landmines certainly bring the two together in a variety of ways, but so does sequencing of areas to be cleared, strategies of mine laying and clearing, different approaches to dealing with local communities, government demining and legal capacity, and the different ways of operating for domestic and international private, humanitarian and government organizations that engage in a variety of types of demining. Two of the more problematic linkages are land grabbing that occurs on the heels of demining, and lack of awareness on the part of demining organizations. The first occurs in a variety of ways and to such a degree that some communities do not want their land to be demined because they fear it will be seized, while others purposefully plant mines to deter seizure, demarcate, or otherwise provide for fairly strange forms of tenure security in wartime settings. The second is related to the first in that most demining organizations are very unaware of the land problems they can leave in their wake. With very little capacity to deal with land issues, or even enough awareness to avoid land conflicts that they contribute to or cause, most demining organizations seek safety in their stated and much valued notions of ‘neutrality’.